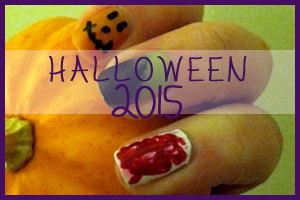 Note: I applied this polish on October 30th and the photos were taken on the 31st and November 1st. 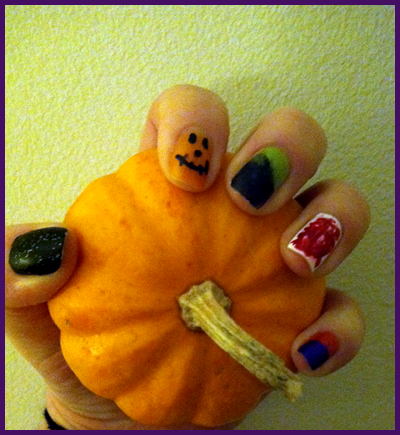 I went simple for my Halloween mani this year. No stickers this year (last year was a nightmare!). 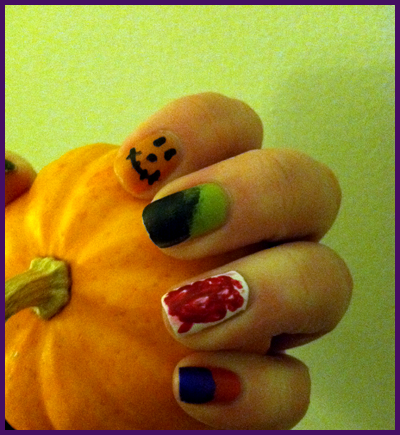 I googled Halloween mani and decide to try to mimic some things I found and try to make them my own. Pinkie - I used Sinful Colors 'Courtney Orange' (aka my favorite orange) as a base. I added Sinful Colors 'Let's Talk' by hand with the brush (I am so not good at clean lines yet) to have a duo color. Somehow 'Let's talk' majorly stained my nails despite the base coat and the base color. I don't recall ever having that issue with this color before so I was baffled. I also didn't take the mani off until November 8th so I am surprised it did it was that much wear on it. Ring - I used Sinful Colors 'Snow White' (aka my favorite white) as a base. I then used drops of Nicole's 'Challenge Red-y' and smeared it with a nail stick. I originally was going to go for blood drips but ended up making blood smears. Haha. Middle - I used Sinful Colors 'Curry Up' as a base. I then used a sponge and applied Sinful Colors 'Black on Black' on the tips to go for a duo look similar to my pinkie finger but I wanted it to look more meshed together if that makes sense. It didn't really work so I ended up adding more black onto the nail than I intended. Index - I used Sinful Colors 'Cloud 9' as a base. I really should have used 2 coats for this one since this orange is so thin but I figured since I was drawing on it, it didn't matter. 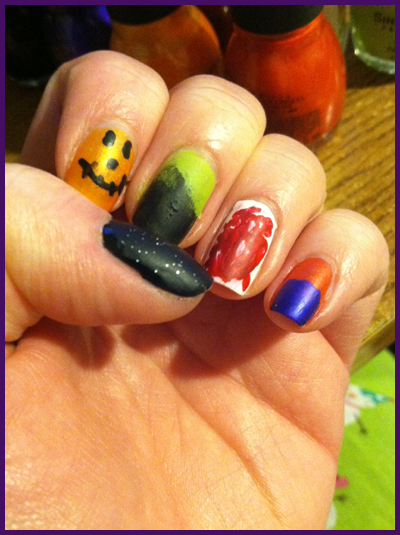 I used my only nail brush (I seriously need to get more) from Avon and drew my poor attempts at faces so it looked like a face on a pumpkin. The black I used was 'Black on Black'. Thumb - I used 'Black on Black' again as a base and then used Sinful Colors 'Starry Night' on top (if you don't have this glitter, get it! It's lovely and perks up any mani if you want a dash of sparkle!). I had zero application issues. All polishes applied I used just one coat. I decided to use the matte top coat again and I really liked the result. Dry time went as usual for Sinful Colors..slow but not overally long as some of the cremes tend to go. I got a really nice wear time from this mani, I didn't take it off until November 8th and it wasn't majorly chipped. Overall I am giving this mani a 5 out of 6. 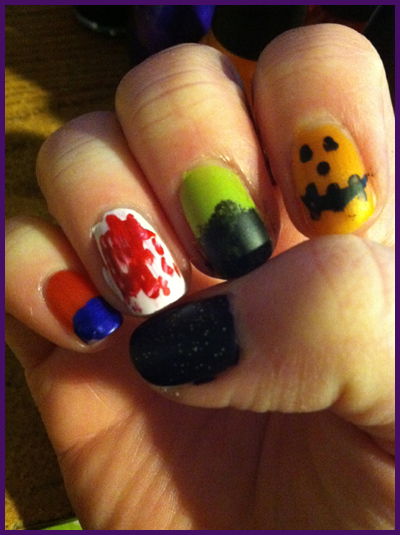 I thought it was a cute mashup of Halloween inspired nails. I wish I had executed better with cleaner lines but I am still working on being steady.